McGuffin, who is now a litigation associate with Stites & Harbison, won the 2014 Bass Berry & Sims Moot Court competition with her partner, Kendra Key. “I knew she was a very strong public speaker,” she said. “I’m a strong writer, and we played off each other’s strengths, which led to our success.” During her final year of law school, McGuffin served on the Moot Court Board as executive problem editor, heading the team of students who research and write the legal problem students participating in the competition must argue. “The competition always deals with a problem in First Amendment law, and I wrote the bench brief—the answer given to the judges that gives them a brief overview of arguments and questions on both sides,” she explained. 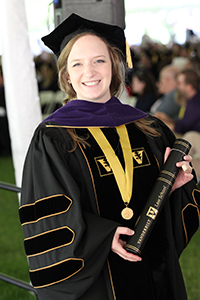 A recipient of the Thomas R. McCoy Scholarship, McGuffin particularly enjoyed her law courses dealing with regulatory law. As a 2L, she served as a research assistant for Associate Dean Kevin Stack on a project examining how administrative agencies interpret statutes. During her first year, she recalls being surprised that she enjoyed Contracts, taught by Professor Tracey George. “Professor George is a fantastic teacher who gets to know all of her students,” McGuffin said. “Contracts deals with arcane rules, but she makes it relevant and interesting.” She received the Robert F. Jackson Memorial Prize for maintaining the highest scholastic average in her class during the first two years of law school, and the Archie B. Martin Prize for maintaining the highest general average for the first year of law school. McGuffin received the Founder’s Medal in recognition for graduating first in her class at Commencement. She was a law clerk for Judge John Rogers on the U.S. Court of Appeals for the Sixth Circuit for the 2015-16 term, after which she joined Stites & Harbison in Lexington.